Did you know? 11,000 loving, adoptable pets are put to death every day in America just because they don’t have a home. We share the same belief as Simple Dog Project fundraisers that every dog and cat deserves a safe and loving FUR-ever home. When you adopt a cat or dog from your local pet rescue organization or shelter, you save a life and make a friend for life. As we come to the end of another stellar year, we need to really take note of our volunteers’ accomplishments. The Miami Beach project is one such example. Where else in the country do you get such dedicated volunteers? 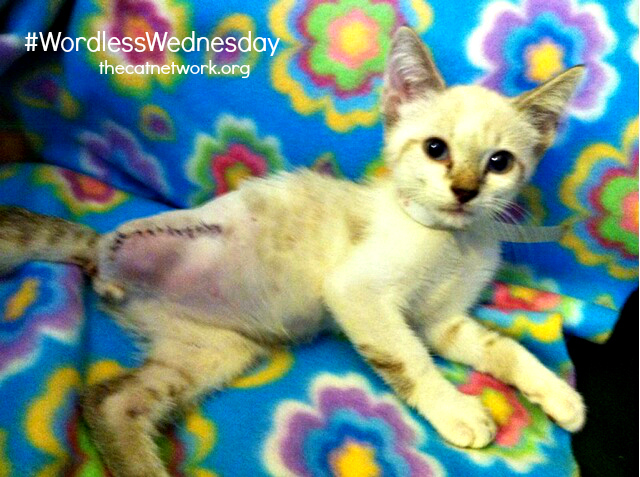 In approximately seven months, over 800 kitties will find themselves sterilized. This is the kind of gift that will continue giving for many years. Not only that, Miami Beach will have less complaints of nuisance cats and tourism will not suffer. It’s a win-win situation. Mary Thingelstad and her merry group of trappers have been phenomenal. We are on target to sterilize 1,000 kitties by early next year. Once we hit that milestone, PetSmart Charities should be able to release the funding for the next year so another 1,000 kitties can be sterilized on Miami Beach. Just next door, the Town of Surfside has also qualified for a PetSmart Charities grant. Suely Carmelo has headed up this project. As a force of nature, Suely has actively been trapping there for many years as funds allow. This grant will allow 250 cats to be sterilized in a one year period. Sunny Isles is also moving toward a TNR program as well. Wouldn’t it be great if we had all the municipalities along the beaches embrace TNR? Of course, Miami-DadeCounty voters spoke and the Pets’ Trust passed at an almost 2:1 margin. CN members actively took to the polls to educate the public. From some of the feedback we received, voters were very concerned about whether or not CN would be involved with the implementation of the spay/neuter aspect of the program. The ASPCA partnership is also entering its third year. Along with Miami-Dade County Animal Services and the Humane Society of Greater Miami, we are trending toward a 60.1% live release rate for the animals of Miami-Dade. The final numbers aren’t in yet, but our live release rate may have increased by 8%. Given the number of animals in our community and their prolific lifestyle, a 1-2% increase is noteworthy, an 8% increase is outstanding. CN is also extremely grateful to our fabulous donors, who gifted us with a cargo van. Even though we aren’t doing as many transports, the vehicle is being used for the large scale trapping projects we seem to be participating in with increased frequency. 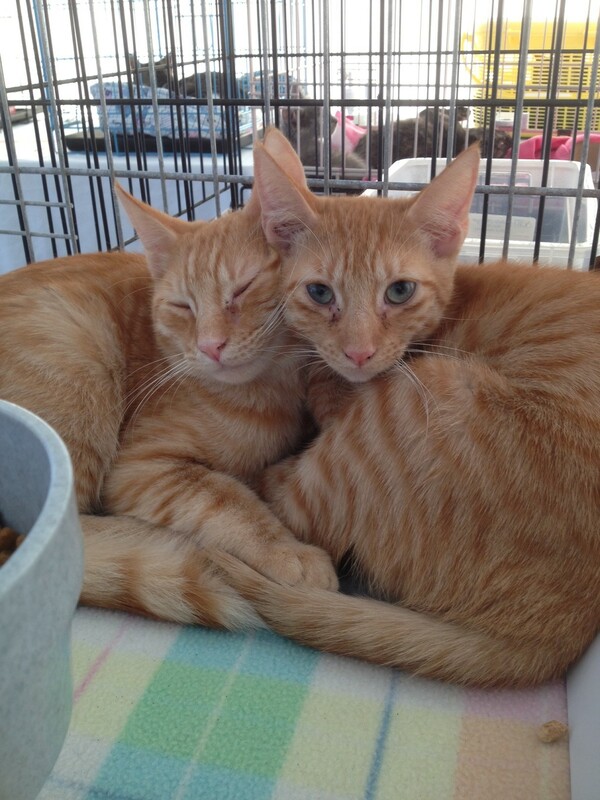 CN Foster Parents adopted almost 900 cats and kittens to the public this year. We are always looking for off site locations to showcase our adoptables and welcome your suggestions for new venues. Finally, as we move toward increasing our spay/neuter events, the Meow Mobile will be getting out in the community more often. This year, we facilitated over 7950 surgeries through our participating veterinarians and the Meow Mobile- over 3000 on the Meow Mobile alone. As part of our commitment to the ASPCA and the community, we need to do an additional 1400 surgeries. As always, The Cat Network, Inc. is dependent on our volunteers. We are extremely grateful for their donations of time, resources or money. In 2013, we can always use more volunteers at the adoption centers, trappers who are willing to travel out into the community to help with special projects or a financial contribution. Give Miami Day 12/12/12 is Here! Comments Off on Give Miami Day 12/12/12 is Here! Today (12.12.12) is #GiveMiamiDay. Join us for a unique 24-online giving day sponsored by The Miami Foundation. From midnight December 12 to midnight December 13, we’re asking for your support to donate to The Cat Network. 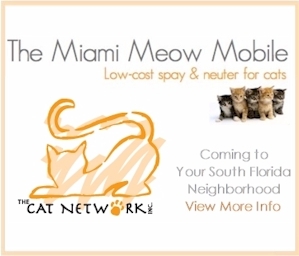 By investing in The Cat Network on Give Miami Day, you will become a part of the solution for the feline overpopulation problem in South Florida. 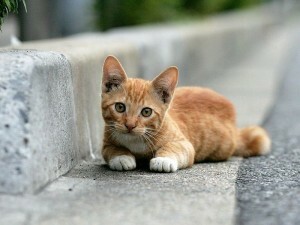 We will be able to continue offering low cost Spay/Neuter Certificates and events to help you help the community cats. This year we have been able to help the public sterilize over 7900 cats and kittens and have adopted over 800 felines to loving homes. Please donate now at http://j.mp/givemiami12. Donations through midnight tonight and will be percentage matched by the Knight Foundation. Give Miami Day is Coming! The Miami Foundation, with support of the John S. and James L. Knight Foundation, will launch Give Miami Day, a unique, online giving event that enables individuals to support the important work nonprofits do in the community. For 24 hours on December 12, 2012, the public can donate on GiveMiamiDay.org Every donation between $25 and $10,000 received through GiveMiamiDay.org on that day will have a percentage of it matched by The Miami Foundation. Please help us help homeless cats and donate to The Cat Network on Give Miami Day 12/12/12. Santa announced that he will visit all 1,269 PetSmart® stores this December including locations in South Florida, taking photos with pets both naughty and nice. For each photo purchased at select Miami locations, PetSmart will donate $5 to The Cat Network to save the lives of homeless pets in our community. Dec. 1 and Dec. 2: 11 a.m. to 4 p.m.
Dec. 8 and Dec. 9: 11 a.m. to 4 p.m.
Dec. 15 and Dec. 16: 11 a.m. to 4 p.m. Call your local store to verify event times. 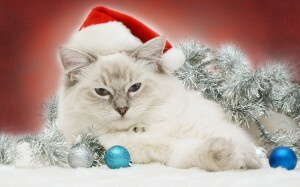 This will be PetSmart’s 25th year hosting the annual Santa Claws® Photo Events. Last year the event raised $864,165 for more than 2,700 animal-welfare groups. PetSmart is hosting three weekends of Santa Claws® photo events at all stores. This annual event gives Pet Parents the opportunity to commemorate the season by having a digital photo of their pet taken with Santa and placed in a collectible holiday frame for $9.95 with a PetPerks® card. PetSmart adoption partners play Santa, and $5 from every photo package will be donated to these participating partners to help save the lives of homeless pets. The Miami Marlins and Miami-Dade County Animal Services have teamed up to bring “Holiday Adopt-O-Mania” to the Community of Little Havana! On Saturday, December 1st, the Miami Marlins Ayudan Team, Miami-Dade County Animal Services, along with the Humane Society of Greater Miami and The Cat Network will be on-site oering pet adoptions, vaccinations and spay/neuter for dogs under 50 lbs. Over 200 pets will be on-site and available for adoption! Come out to Marlins Park for food, fun, festivities and more! 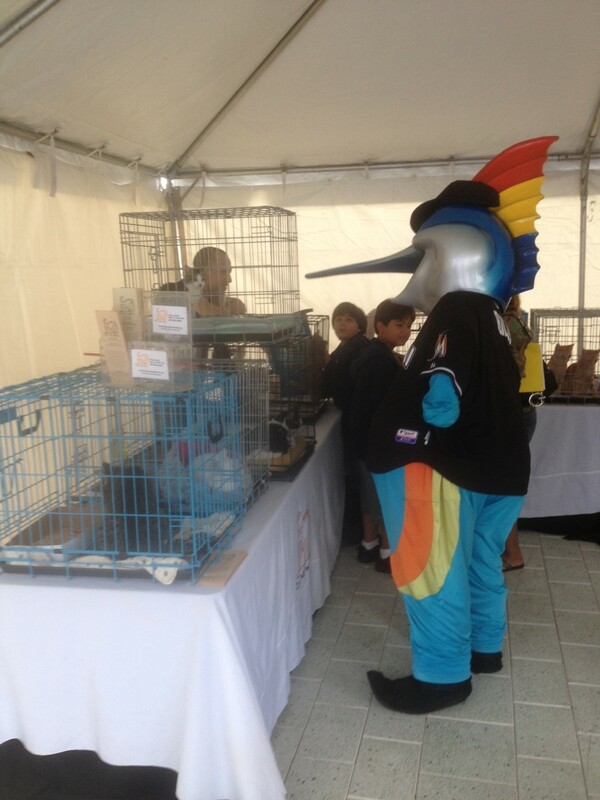 Enjoy live entertainment, the first 100 guests who adopt a cat or dog will receive 2 free tickets to a 2013 Marlins game. Pet adoptions, microchipping and vaccinations from 10:00 AM – 2:00 PM Spay/Neuter services for dogs by appointment only by calling 311. 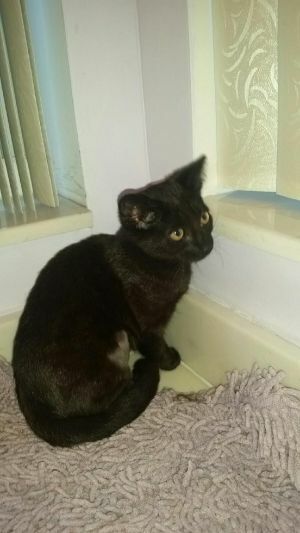 This is “Max.” He was rescued from Miami-Dade Animal Services by Cat Network members having lost his leg due to an injury. We are only able to help kittens like Max through your generous donations. Please help us continue our mission of helping cats in need by making a donation through our online cause by clicking here. The Humane Society of Greater Miami, Miami-Dade Animal Services, and The Cat Network, together with rescue groups from all over South Florida, will host the event at the covered Equestrian Center in Tropical Park, 7900 Bird Road in Miami. This is a family affair with an entire Kid’s Festival, presented by the ASPCA, complete with rides, and fun games for children of all ages. There will be entertainment and refreshments by a variety of vendors and performers including Ballet Dance Exchange, Belly Motions, Inc., Blood Centers of Florida, Canine Counselors, Carioca Capoeira Miami, D.J. Uneeq, Doggie Bag Café Chefs, Dogzy Collars, Alex Murga & Ezpinaz, Game Time, Glamour by J’s, Gourmet Truck Expo, Grove Naturals, Hurricane Jumpers, Ice Cream Time, Live! Modern School of Music, Maria Verdeja School of Arts, Mary Lundberg Art, Natalia Dance Show-Cabaret, PetSmart, Yomo Essentials, and more. Admission to the park is free and complimentary parking is available in the park. 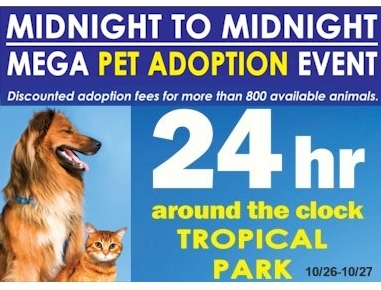 For more information call David at 305-749-1818, or email david@humanesocietymiami.org.